Introduction to Security has been the leading text on private security for over thirty years. 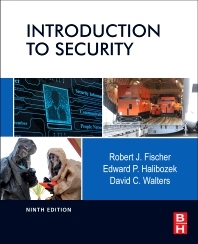 Celebrated for its balanced and professional approach, this new edition gives future security professionals a broad, solid base that prepares them to serve in a variety of positions. Security is a diverse and rapidly growing field that is immune to outsourcing. The author team as well as an outstanding group of subject-matter experts combine their knowledge and experience with a full package of materials geared to experiential learning. As a recommended title for security certifications, and an information source for the military, this is an essential reference for all security professionals. This timely revision expands on key topics and adds new material on important issues in the 21st century environment such as the importance of communication skills; the value of education; internet-related security risks; changing business paradigms; and brand protection. Robert Fischer is President of Assets Protection Associates, Inc., a security consulting firm established in 1986. He earned his Ph.D. in education administration from Southern Illinois University in 1981. Dr. Fischer has served as a consultant to many organizations, including publishers, private security firms, retailers, and school districts. Dr. Fischer is a member of the Academy of Criminal Justice Sciences, the American Society for industrial Security, The Academy if Security Educators and Trainers, and the International Police Association. He recently retired from his positions as the Director of Illinois Law Enforcement Executive Institute, a project of the Illinois Law Enforcement and Standards Board, and as a professor of law enforcement and justice administration at Western Illinois University. It is without a doubt one of the best in the security industry. I based this on the years of experience on the part of the authors. Holistic Security Through the Application of Integrated Technology is a chapter I look forward to reading several times.